There were 14 Double Gold awards given as well as 24 Gold, 94 Silver and 128 Bronze. The committee was especially pleased with the 39 awards won by wineries that had entered for the first time. Several judges commented on the high quality of the wines entered this year. We are excited that our competition is not just growing, but is improving as well. We wish to express our thanks to all who participated and our congratulations go out to all the award winners. 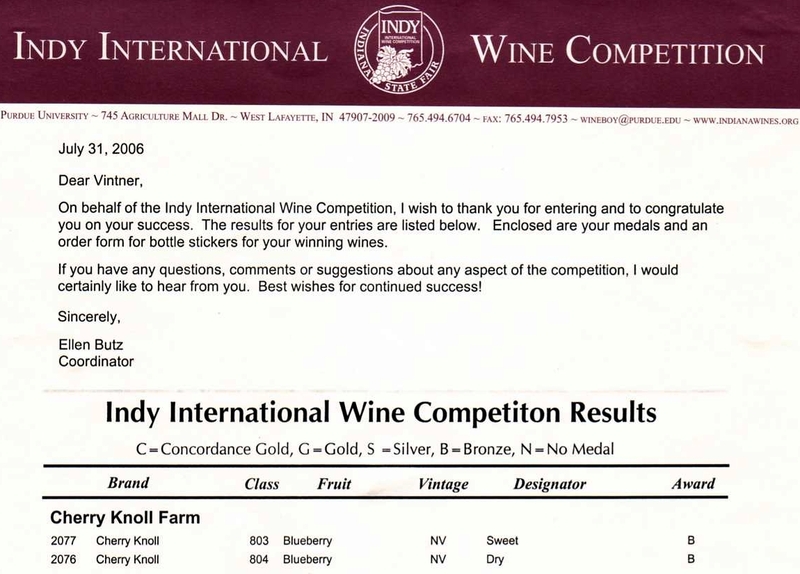 CANANDAIGUA, NEW YORK, AUGUST 16 – In its first year of operation, Cherry Knoll Winery won two bronze medals with its Dry Blueberry Wine and Sweet Blueberry Wine at the 2006 New York Wine & Food Classic competition, held on August 15 & 16 at the Inn on the Lake in Canandaigua, the northwest gateway to Finger Lakes wine country. This year’s competition included over 700 New York wines from Long Island, the Hudson Valley, the Finger Lakes, Niagara Escarpment, Lake Erie, and other regions of New York State. The awards were based on blind tastings by 24 expert judges, which included a majority from other states, with a large contingent from California. Judges included prominent wine writers, restaurateurs, retailers, and wine educators. Four-judge panels determined the initial awards, with top-scoring wines evaluated by all 24 judges for Best of Category and Governor’s Cup awards. Celebrating its 21st year, the Classic is organized by Teresa Knapp of the New York Wine & Grape Foundation and is open to all 239 New York wineries from all regions. In 2006, a total of 30 Double Gold, 53 Gold, 200 Silver, and 249 Bronze medals were awarded.